Over 200 people, many of them Australians, died horribly on or following the night of 12 October 2002 in Bali, wiped out instantly in a toxic flash of chemicals and hate or perishing later from ghastly burns and injuries. This mini-Hiroshima also injured many and left them and the relatives of victims, Indonesians and foreigners alike, bleeding deep inside. The bombings in Kuta ten years ago were a defining moment. For all involved with Bali, though most particularly victims and their families, time in Bali is now divided into before and after that searing flash. For most, 'before' is shorthand for an imagined golden age of non-violence and peace. Seductively packaged by the tourism industry, Bali was, and is, marketed in picture-perfect images as a paradise. Bali is 'the morning of the world', innocent and fresh, a window onto life as it should be before being exposed to the cruel light of day. That powerful image brought both revellers and Indonesian hospitality workers to the Sari Club and Paddy's Pub that fateful night. 'After' is the rude realisation that Bali is vulnerable and not all it appears to be. Globalisation, deregulation of the Indonesian economy, and Bali's insatiable appetite, if not addiction, to tourism have exposed this delicate organism to powerful, sometimes destructive, forces. The bombing did not target Balinese directly but the collateral damage to tourism, their bread and butter, was taken very personally by the Balinese. Drawing his finger across his throat in a slitting motion, a smiling Balinese told me he is happy the bombers have been executed. Tourism has since recovered and Bali's economy is growing faster than the national average. Though perpetrated by non-Balinese in the name of Islam, the bombing is also an unpleasant reminder that Bali is much more complex than the smiles of its people and commercialised image suggest. The massacres by Balinese in 1965 of some 100,000 fellow Balinese demonstrate that, like other societies, Bali is capable of extreme violence when it feels threatened. Then it was the spectre of communistic atheism. Today other forces threaten the balance and sense of control so highly prized by the Balinese. Islam, colonisation by Jakarta, and economic inequity are cited as examples. The shock waves from the bombing rippled far and wide, not least to the 22 countries outside Indonesia whose nationals died. Working in Timor-Leste at the time, I recall fears that Dili could be next, given the presence of a large expatriate community and reported claims by Osama bin Laden that Australians were targeted in Bali because he (wrongly) held Australia responsible for Timor-Leste's liberation from Indonesia. Already fortified in response to the September 2001 attacks in New York, the Australian Embassy tightened security and the UN forbade its staff to visit Bali. At the time my daughter was enjoying the unique experience of life in an Islamic boarding school near Banyuwangi in East Java across the strait from Bali. She recalls watching television coverage of the bombing with the Muslim head of the school, his family and teachers. They grieved with her in utter disbelief at the loss of innocent Australian lives and condemned the killings as murder and a distortion of Islam. When as worried parents my wife and I visited to check on her, we were treated like family by the pesantren. Like the outpouring of grief recently seen in Melbourne in response to the murder of Jill Meagher, the bombing brought us together in human solidarity. Many other examples of Australian-Indonesian solidarity since the bombing can be pointed to, including today's visit to the bomb site by PM Gillard and President SBY. The recently concluded Ubud Writers and Readers Festival held in Bali, which I attended, is another good example. Now in its ninth year, the festival is the brain-child of a dynamic and creative Australian, Janet De Neefe, who started it in response to the Bali bombing. Oddly its program did not feature the tenth anniversary, but the festival was an outstanding example of international cooperation of obvious benefit to Ubud and Indonesia. It brought many published writers and their fans to Ubud, in the process showcasing the best side of Bali and a number of Indonesian writers to the world. Many died as a result of the 12 October bombing, including suicide bombers and their handlers. It is not easy to pray for the repose of their souls. At the very least, may their victims rest in peace and the people of Bali be allowed to live in peace and determine their own future, free from further violence. Pat Walsh AM is currently in Bali, where he has launched the Indonesian version of his collection of writings on East Timor, At the Scene of the Crime: Essays, Reflections and Poetry on East Timor, 1999-2010 (available from Mosaic Resources). 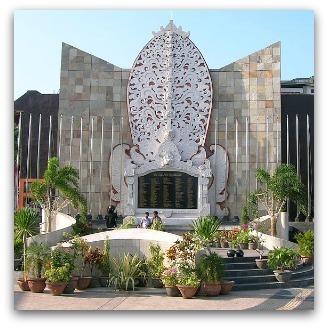 Image: The Bali bombing memorial at the site of the original Paddy's Pub across the road from the site of the now demolished Sari club. Thanks for this, Pat. Although the bombings were not specifically mentioned at the Festival, I thought that the theme this year, Bumi Manusia (This Earth of Mankind), presented a strong testament to our common humanity and a counterpoint to terrorism and those advocating it. That came out in some of the sessions I went to. The Muslims I work with here in Indonesia are all appalled at the way in which Islam has been distorted by those advocating terrorism. I just wish the politicians would stand up and be counted! Interesting that your daughter was attending an Islamic boarding school in Java at the time of the Bali bombings and the reaction of the teaching staff there, Pat. You, she and the rest of your family now have an experience of Indonesian Islam which most Australians do not and would find a pleasant surprise as, due to a small number of radical schools, this is not the normal image they have here. This in depth experience would have been hard for many Jakarta based long term expats to replicate. Indonesia needs peace and coexistence between all its varied peoples and faiths. Two young men from our small town lost their lives in the Bali bombings. A youth centre has been built, slowly over these ten years, in their memory. Craig and Danny loved to surf and they were great mates throughout high school and visiting Bali was their first time overseas. interesting that you say a "mini Hiroshimna", Joe Vialls claimed that the bali bomb was a mini nuke buried in a drain. If this is true then it means that the culprits who were fingered for the job, were only a diversion and were effectively patsies.